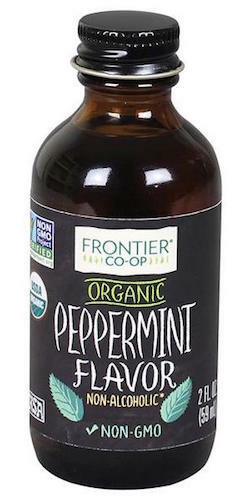 Frontier Natural Products Organic Peppermint Flavoring 2 oz. Peppermint Flavor is non-alcoholic and a best friend to chocolate, holiday baking and yummy drinks. For a minty and refreshing twist, add a few drops to cupcakes, scones, brownies, frostings, milkshakes, puddings or homemade ice cream. This item is not available for expedited shipping and must be shipped via ground service. Ingredients: organic sunflower oil, peppermint oil.